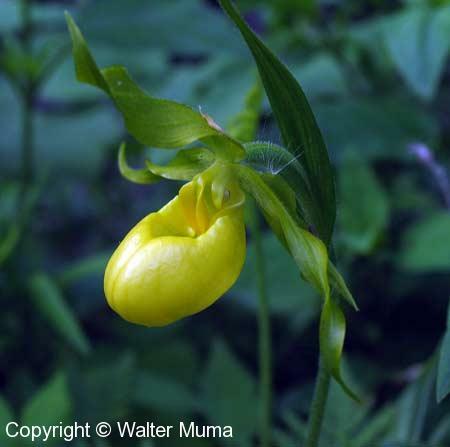 Distinctive features: Lady's Slipper flower form, bright yellow. 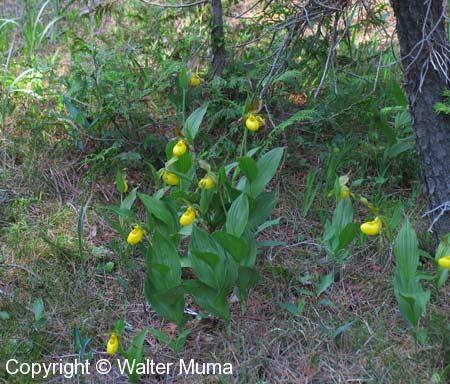  Small Yellow Lady's Slipper (Cypripedium parviflorum var makasin) - Smaller; purplish petals behind the "slipper".  Small White Lady's Slipper (Cypripedium candidum) - Small, white flowers; greenish petals.  Hybrid Lady's Slipper (Cypripedium parviflorum X C. candidum) - Small, white flowers; purplish petals. Flowers: Summer; Yellow; Irregular flowers; Bright yellow, pouch shape. Petals (behind the "slipper") are green (Small Yellow Lady's Slipper (Cypripedium parviflorum var makasin) has reddish petals). Late spring - early summer. Habitat: Forests, Fields and Open Areas, Wet Areas; Moist woods, bogs. Status: Uncommon, but common compared to other Lady's Slipper orchids. But in some places it is extremely common. Notes: There are two varieties of this orchid: Large Yellow Lady's Slipper and Small Yellow Lady's Slipper (Cypripedium parviflorum var makasin). When you find this orchid, do not disturb it. DO NOT transplant it - it will likely not survive. Photographs: 528 photographs available, of which 5 are featured on this page. SCROLL DOWN FOR PHOTOGRAPHS. Large Yellow Lady's Slipper. The petals are green and the flower is bigger. This variety grows in woods. A group of Large Yellow Lady's Slipper in the woods in mid-June. Flower just starting to open. 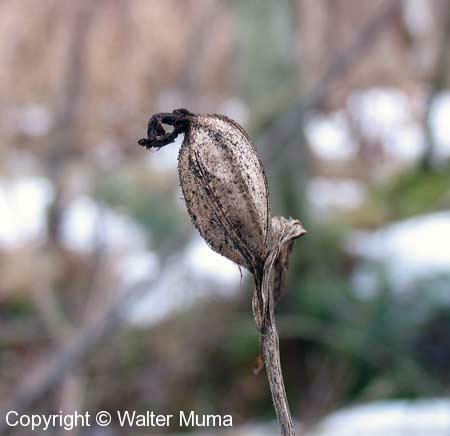 Seed capsule from previous year. This photo was taken in January. (I don't know which variety of Yellow Lady's Slipper this is, but they both look the same at this time of year! ).